It’s been raining here a lot the past few days, sheets of rain in fact. It makes driving into the City on a daily basis so much harder with traffic, drivers going too fast and the pouring rain causing slick roads. Although I suppose I can’t complain too much, California needs the rain now and I’d rather have wet roads then the piles of snow the East Coast keeps getting hit with. The rain has positive qualities though, I love the biting cold it brings, it feels amazing on my skin, I sleep so much better with the steady pounding of rain drops on my window and it put me in a soup mood. I love soups of all types, Cambodian Herbal Chicken, Lentil & Sausage, Pho, Soondubu, Ramen and Chicken Noodle just to name a few. There’s something that makes you feel so cozy and comfortable when tucking into a hot bowl of warm slurp-tastic goodness. I wanted something incredibly easy to make, good for me and full of flavor last night. I just happened to be looking in my cupboard and spied a bottle of yellow curry powder, luckily I had also bought a ton of baby carrots for my snacking pleasure. 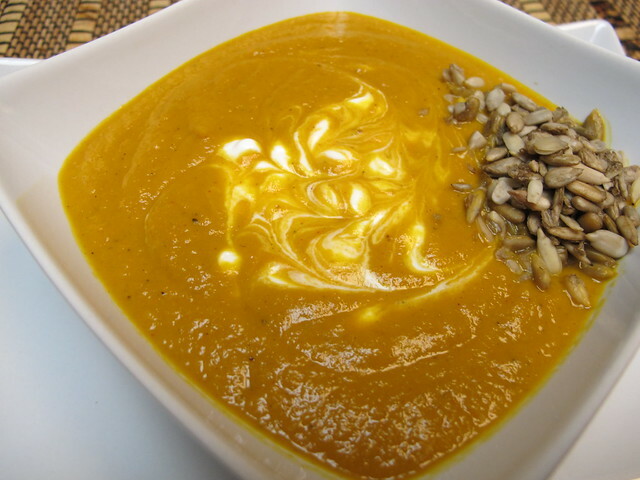 I decided it was kismet and I must, absolutely MUST make myself a bowl of Curry Carrot soup. Even better, it was vegan, no animal fat was needed to make this beauty creamy and satisfying! 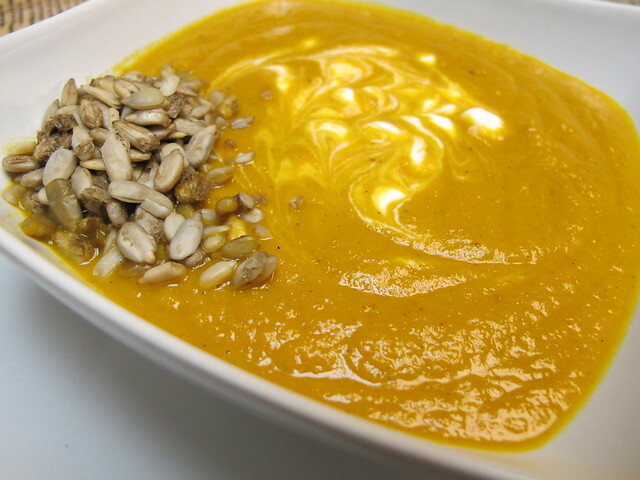 Plus I’m going to reveal my secret ingredient I use in most of my blended Veggie soup, gosh, I’m just GIVING everything away in this blog! 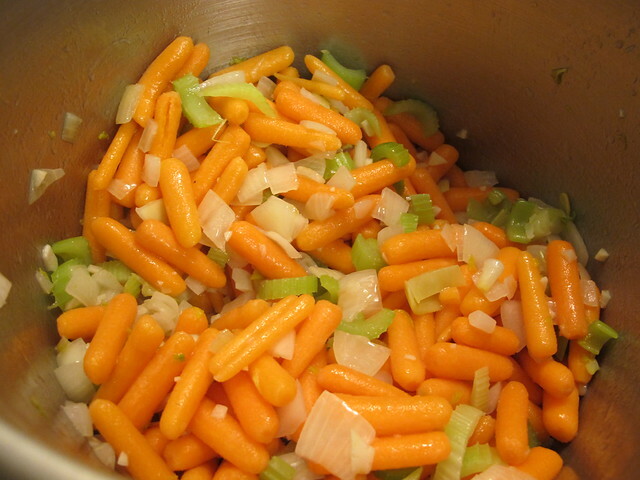 Don’t worry if it seems like I’m making a ton of soup based on the ingredients. I usually double or even triple recipes when I cook. I have a family of eaters after all! Also, don’t bother chopping the veggies perfectly, we’re going to blend this bad boy in the end so size in this case, really doesn’t matter! 1. 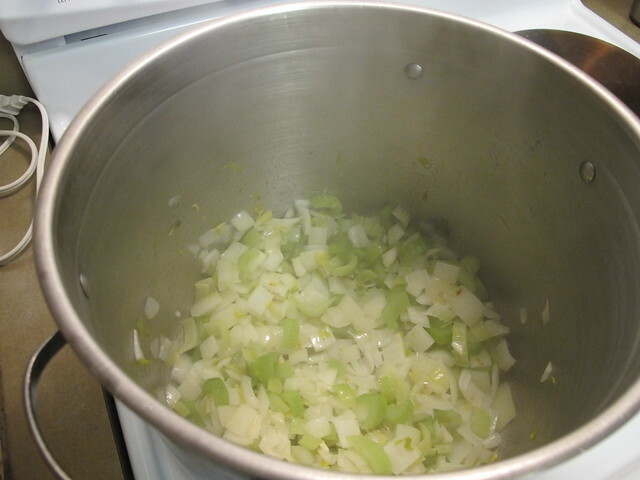 Over medium high heat, add olive oil and saute onion, celery, garlic and ginger until fragrant and they begin to soften. Steamy that picture is, I know! 5. 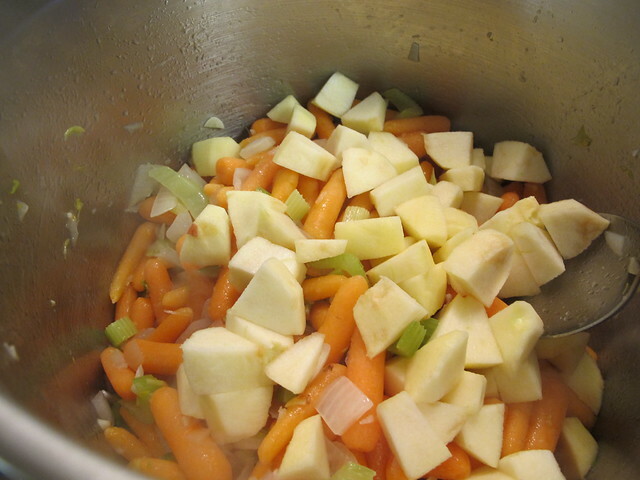 Add enough Veggie Stock to cover all the veggies, throw in the bay leaves and let it all come to a boil. 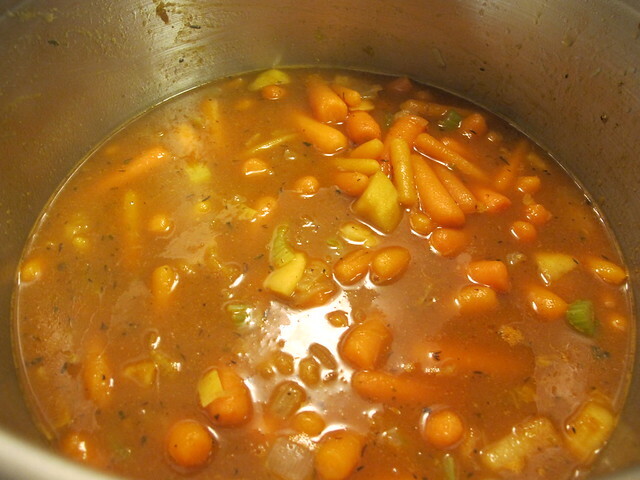 Pull the heat down to a simmer and let the big pot of goodness go until all the veggies are soft. About 20-25 mins. 6. 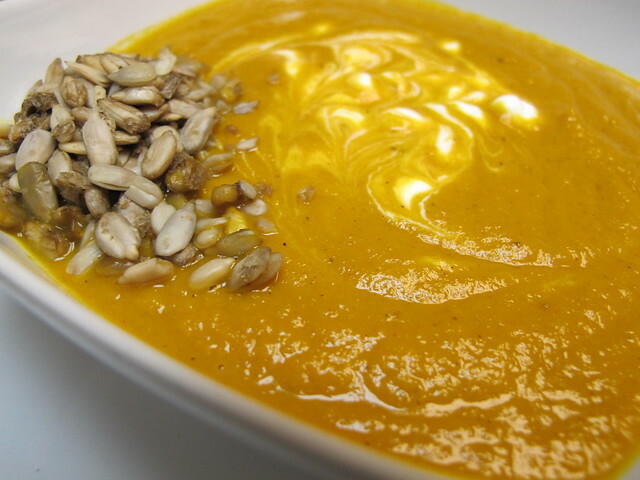 In a blender (or an immersion blender if you have one), blend soup to desired consistency. 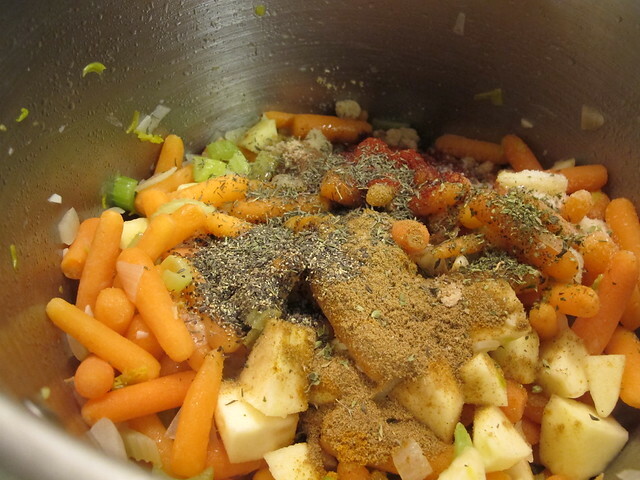 I like mine fully blended and thick, if you like a soupier texture, add a little extra Veggie Stock when blending. 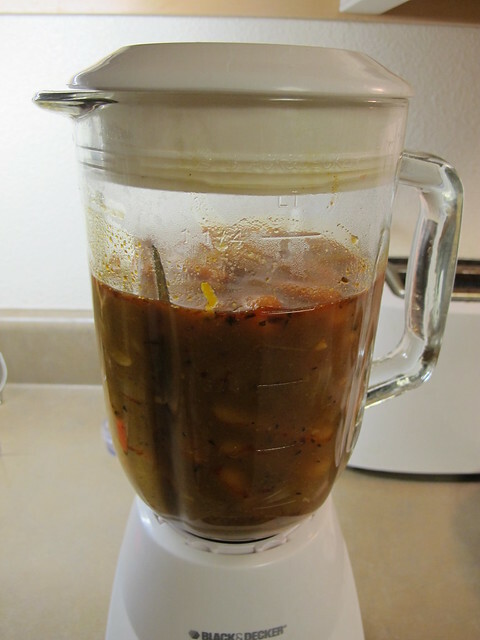 BE CAREFUL when blending hot soups! Only fill blender a little over half, take off the plastic center of the lid and cover the hole with a kitchen towel holding down on the lid. Start with a low speed then increase it to a higher speed as you blend. 7. 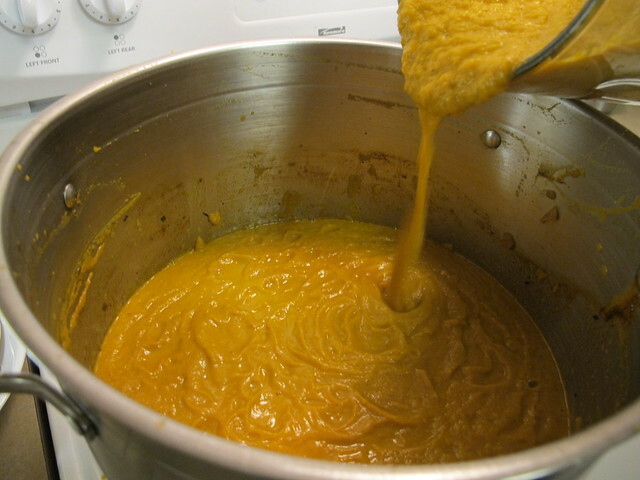 Pour Curry Carrot Soup puree back into the pot to keep warm. The texture I tell you, just like velvet!! 8. Enjoy a bowl as is or with your favorite toppings. I just happened to have a tsp of Sour Cream left in my fridge (my family is notorious for putting empty containers back in the fridge, I had to scrape the sides down for my tsp of sour cream!) and roasted sunflower seeds on hand. Fresh, creamy, high in fiber and oh so good for you! You get hints of sweetness and delicious carrot flavor first, then you’re hit with a beautiful curry flavor and the velvety texture. Make this for dinner tonight, you know you want to! Week 9 of 52… CHECK!!! Thanks Ani! 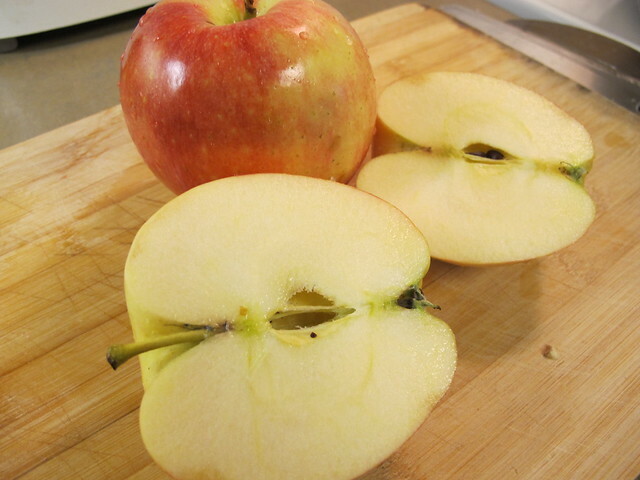 I’ve added apples to almost all of my pureed soups, it lends a different type of sweetness plus you don’t need to add refined sugar as most red skinned apples are sweet enough on their own. I love a bit of apple in roasted red pepper soup also!